The Standing Rib – is the section next to the wing. It is composed of seven to eight ribs; the one referred to as the “prime rib” is cut from the first five ribs and it is the best. The Wing Roast – is cut from the loin section next to the ribs. It is triangular in shape and contains little or no tenderloin. 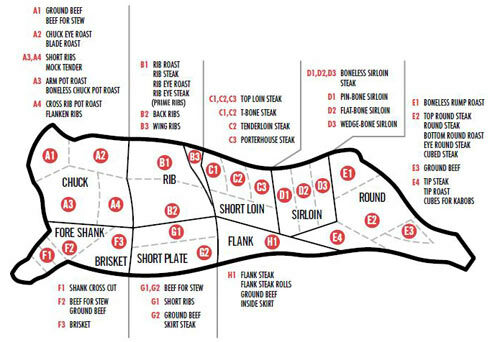 The Porterhouse or T-Bone Roast – is cut from the loin next to the wing. It contains the T-shaped bone and most of the tenderloin or undercut. The Sirloin Roast – is cut from next to the porterhouse. A rolled roast is easier to carve and sometimes more economical but never as tasty and juicy as the prime rib roast. The Beef Fillet – is expensive, tender and considered by many as the very best; it contains some tenderloin. As this cut is usually prepared for steaks, it is advisable to ask the butcher to reserve one.